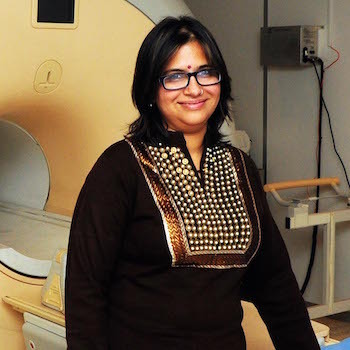 Nandini Chatterjee Singh has been a scientist and professor at National Brain Research Institute. Since January 2017 she has been on deputation at the UNESCO Mahatma Gandhi Institute of Education for Peace and Sustainable Development in New Delhi (.http://mgiep.unesco.org/) where she is leading the development of neuroscience based digital pedagogies to build Socio-Emotional skills in school children. She continues to be actively training teachers and psychologists in DALI (Dyslexia Assessment for Languages of India) and is passionate about building awareness for learning differences. Dr. Nandini Chatterjee Singh has a Ph.D. in Physics and studied bird songs during her postdoctoral fellowship at University of California, Berkeley. Later, her work has unraveled intricacies of language communication. Her work with language and music has multiple applications in education, detection of language disabilities and improving language hurdles, especially for children from developing countries. Q1) What are the major take home messages from your research? My research focuses on understanding language, literacy and music in the brain. (1) The structure of the writing system influences neural reading circuitry. Reading, which is probably one of the most important inventions of humankind has cultural differences in terms of neural circuitry. In this context, the mapping of letters to sound also called orthography has an important role to play. Thus Hindi which has a simple mapping between letter and sound uses one circuitry whereas English where the sound to letter mapping is complex uses a different circuitry. Our work with Hindi-Engligh biliterates has shown that skilled readers of these languages demonstrate a unique neuroplasticity, they modulate the activity of different brain areas depending on the language they read. They read Hindi through one circuit and English through another. Interesting, our recent work has shown that the symbolic structure of the script also has neural consequences and Devnagari which is (visuo-spatially) complex with its matras elicits visual activity in both hemispheres of the brain while reading. (2) Our work on music has been quite exciting from a different angle - In the context of autism spectrum disorder we have shown how the brain networks for music (in particular 'sung speech') are preserved across the autism spectrum whereas those for speech are not. This has opened up a new window for intervention and we are hoping to use music as medium to communicate and educate kids with autism. More recently, our work with North Indian Classical ragas has shown that different ragas elicit different emotions and this is influenced by the underlying acoustic structure of the ragas. An interesting finding has been the important role of the minor second (komal re) in eliciting plaintive emotion. Q2) How do you see your research on the brain being applied to real world problems in developing countries? I think our research on reading has enormous impact in education. In a time when the world is a global village and children are growing up in environments where they speak and read multiple languages, our work has shown that the human brain is capable at a young age has the flexibility to learn and adapt to different writing systems. However the order in which these might be taught to the child may have important consequences for how well and how quickly the children learn to read. It has also brought to fore the idea that assessments of dyslexia must be carried out in all languages the child reads in and crucially in developing countries in the native language. Q3) How did you get interested in the research that you love doing? I studied neuroscience of songbird learning after my PhD in Physics. I started out as an analyst of neuronal data recorded from auditory neurons at UC, Berkeley. When I began to understand the biology behind it I loved it so much I started to investigate how these processes occurred in my baby daughter and since then there has been no looking back. It has been road of learning and excitement all the way. Q4) Where do you see the research on music leading us towards? The work on music has just begun - Indian music has such an ancient history and is dominated by vocal learning. Thus even if a person learns to play an instrument, vocal learning is still an important part of training. This is very different from Western music which is mostly written. It will be exciting to investigate how this influences the brain. The work on emotion and music has many ramifications for both basic and clinical research. How combinations of different notes influence different emotions and how these might be effective in learning and mood disorders is worth investigating in future. Q5) What would be your message for the young minds? I think we live in an interdisciplinary age. Though youngsters head out to acquire training and expertise in one specific field, it is its application in a novel context that is often the most exciting and thrilling. We need to keep our ideas flexible to engage in such activities all our lives. As I entered the world of human cognition at the National Brain Research Centre in India, it has helped me understand the world and its people much better. Most importantly, it has taught me humility and kept alive the miracle and wonder of human cognition. Q6.) Your research has been having multiple social impacts. One of those is development of DALI - Dyslexia Assessment for Languages in India. Could you share some perspectives on what impact it has or can potentially have. The development of DALI has been my single most important contribution in recent years to the field of education in India. The scientific research in the field of reading and literacy acquisition has provided me a detailed understanding of the complex education system in India and South-East Asia (Singapore, Hongkong, Malaysia, Bangladesh - for eg) in general. The current education system in many of these countries requires children to acquire literacy in multiple languages namely the native language and English. Not only is English not the native language of the child but the native language and English belong to distinct writing systems. Literacy acquisition in such a scenario poses several challenges for the developing brain of the child. In the absence of good instructional support both at home and school, this could lead to severe difficulties in learning and literacy acquisition. Consequently, children who do not achieve requisite literacy might be diagnosed as having a learning disability. However, the assessment of disability in children in such complex learning environments is inappropriate and inadequate since standardised assessments are available only in English. DALI (which we developed) is a package of screening tools in native Indian languages (currently Hindi, Marathi, Kannada and English) for school teachers to identify reading problems. It also contains assessment tools for educational psychologists to identify deficits that may be corrected to ultimately enable the child to read. DALI has been validated and standardized in 4840 children across India and is ready to be scaled to include more languages and across larger parts of the country. Since 2017, as part of the Difference Learning Programme ar MGIEP I have further the development of DALI to include Telugu and Tamil. Additionally I have trained more than 200 teachers to use DALI in the classroom and then trained psychologists to diagnose the processes that hamper reading development in children ar risk for dyslexia. AT MGIEP, we are also working to position the findings of DALI to impact education policy in India and countries in South-East Asia, where such awareness for native language learning and assessment is urgent. We have also eecognised the powerful role of digital technology and are developing interactive game to improve sound-letter mapping in the classroom. Q6.) How do you see your contributions and involvement with UNESCO MGIEP with regard to education? At MGIEP, since January 2017, my research has focused on socio-emotional in the classroom. This is primarily because recent brain research shows that students need to be socially aware and emotionally connected before for learning can occur. As a consequence, the integration of socio-emotional learning (SEL) in schools is urgent and necessary to help schools foster pros-social behavior, reduce negative behaviour, improve academic performance and well being in the classroom. Central to this approach is the understanding and evidence, that similar to reading and numeracy, the skills of socio-emotional learning (SEL) can be cultivated by explicit training. In collaboration with a team of program staff I am leading the research and development of a curriculum that is focused on socio-emotional learning. Entitled Libre the curriculum possess three unique characteristics - (a) it is designed to build socio-emotional skills through explicit training (b) it will be delivered through a digital platform and therby support and promote digital literacy (c) it will implement state of the art digital analytics that will enable continuous assessment during learning. This program will be piloted across 10 countries in the next 2 years and also build the necessary research evidence for its integration in the education systems.. Libre has enormous social and educational impact since it will provide socio-emotional learning for children via a digital platform.